When you have a baby, everyone tells you that you will never have a moment to yourself. You believe it, because everyone says it. It must be true. And eventually you think you’re prepared. How bad could it be, right? But you’re not prepared. Not really. Don’t get me wrong. Having a baby is amazing. I wouldn’t trade it for all the chocolate in Switzerland. But I’ve missed cooking. Oh boy, have I missed it. 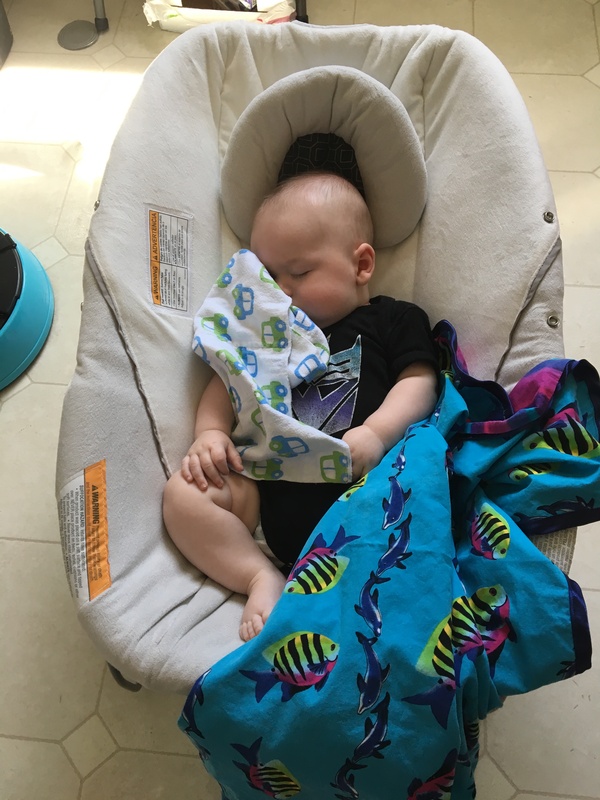 Thankfully, Jack is in a stage now where he can be content for a while in his bouncy chair while I do something else. (Don’t worry, I moved that burp rag he’d been chewing on when he fell asleep.) And he’s already fascinated by the kitchen. So I can finally cook again! Granted, I have to be a little mindful and try to break up the recipe so that I have good stopping points if I need to step away to deal with a meltdown, but still. It feels good to be back in the kitchen at all. 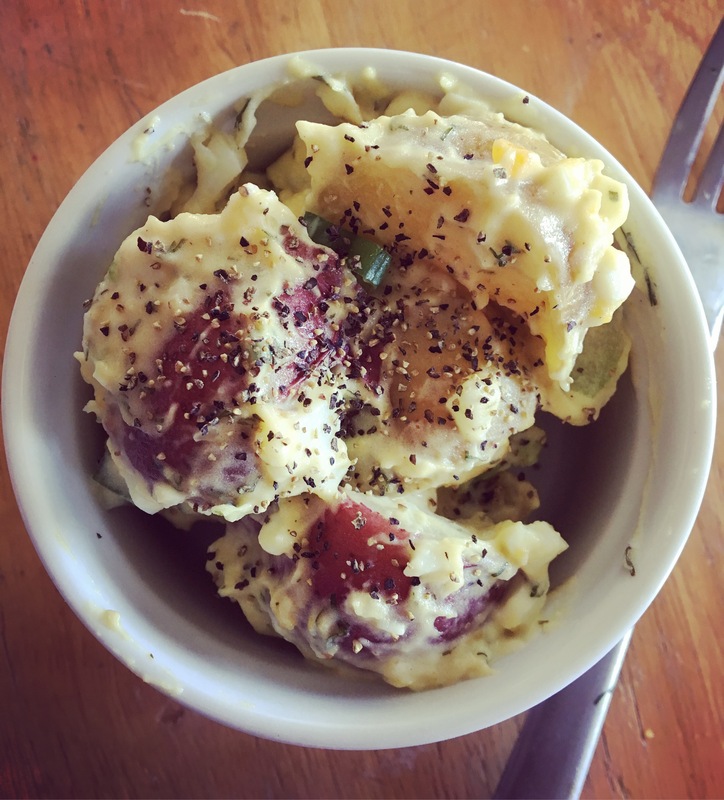 So last weekend, I settled in and made potato salad. It’s one of my favorite spring/summer dishes to make and to eat, and one I’ve been itching to make for several weeks now that the weather has been nice again. 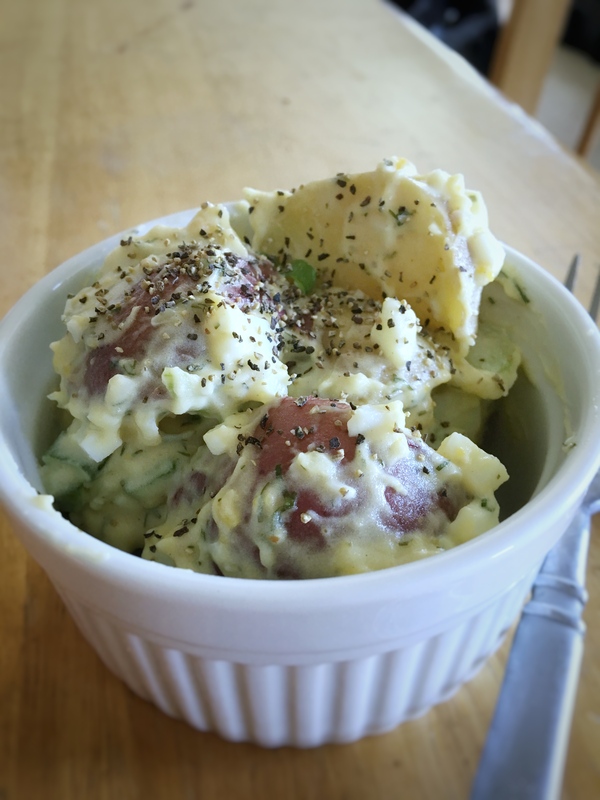 This particular recipe is a touch different from your traditional potato salad, with the addition of fresh dill and ranch dressing and a swap of green onions for the usual white. But trust me, it’s much, much better than the original. My version is a play on the one in Molly Wizenberg’s book, A Homemade Life. (One of my favorite memoirs, as well. I highly recommend.) I like to use a mixture of red and yellow potatoes, and added Dijon mustard and things like celery and pickles for crunch. 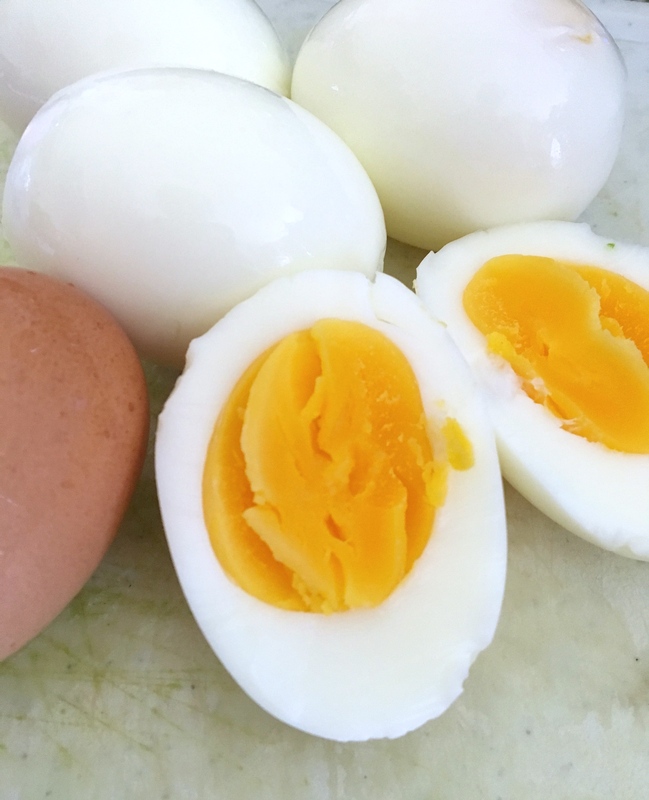 I also chop the boiled eggs down super small, because my boys are picky and don’t like to see that there is hard boiled egg in their potato salad at all. Also, a word on boiling eggs: I used to think I hated hard boiled eggs. Turns out this was because every hard boiled egg I had ever eaten was terribly overcooked. Don’t make that mistake. For fool-proof eggs, place them in a pan and cover with an inch of water. Bring the water to a boil, then place a lid on the pot, and remove it from the heat. Let them sit in this water for 12 minutes and 12 minutes only. Then drain them, cover them with cold water, and place in the refrigerator until they are completely cool. Then peel and enjoy however you’d like! And for easy-to-peel eggs, don’t use the ones you just bought at the store this morning. Use the eggs that have been sitting in the fridge for at least a week. Trust me on this one. So without further ado, here’s the recipe! I hope you all enjoy it as much as I do. Place potatoes in a large pot and cover with 1″ of cold water. Add a generous dash of salt, and place over high heat until boiling. Boil for 10-15 minutes, until potatoes are tender when poked with a fork. (However, be careful not to overcook, as this can easily become mashed potato salad during all of the stirring if you do.) Drain, rinse with cold water, and set aside to cool. Place eggs in a small saucepan and cover with 1″ of cold water. Place over high heat until boiling. Once water reaches a boil, cover with a tight-fitting lid and remove from heat. Leave covered for 12 minutes exactly. Then drain, cover with more cold water, and place in the refrigerator until completely cooled. Then peel and give them a coarse chop. In a large bowl, combine cooked potatoes, chopped eggs, scallions, celery, and pickle. Pour the dressing over the potato mixture and mix well. Refrigerate for at least one hour before serving (it’s actually best if you can make it a day ahead). Taste, and adjust salt and pepper as needed. (I alway top my personal serving with an extra generous dash of coarse black pepper.) Enjoy!